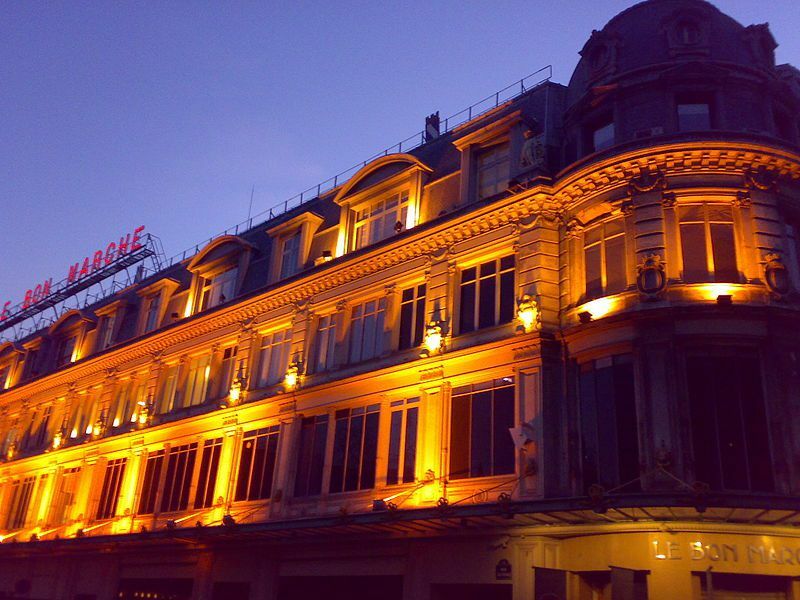 Founded in 1852 by Aristide Boucicaut, Le Bon Marché (it was originally called "Au Bon Marché) is not only a go-to spot for fashion-conscious Parisians of the left bank: it also happens to be a department store with a long, impressive history. Part of the lavish building's internal structure, made of cast iron, was constructed under the direction of Gustave Eiffel's firm. Sound familiar? This is the same engineer and architect from whom the Eiffel Tower took its name. While far less famous, the iconic department store in Paris' chic 7th arrondissement features stunning art deco elements reminiscent of the Belle Epoque era, remains a landmark. The store boasts an enormous and regularly refreshed collection of ready-to-wear designer brands and hosts regular fashion events like runway shows, so if you want a slice of chic, this rive-gauche institution should definitely be on your list, especially during the summer and winter sales in Paris. Meanwhile, during the winter holidays, like the city's other major department stores, Christmas and holiday window displays are a treat for both adults and kids. The vast main store stocks high-end ready-to-wear fashion lines for both women and men from over 40 top designers, including Louis Vuitton, Christian Dior, Chanel, Stella McCartney and Marc Jacobs. A separate high-fashion accessories department completes the department, making it an ideal one-stop destination for whatever look or occasion you're in the market for. The dedicated lingerie department at the store is well-known for its quality and wide selection of brands. Well-known French brands include Aubade, Passionata, Simone Perele and Eberjey. The renowned wedding boutique caters to those looking for semi-designer or designer wedding attire; on-site consultants can help you put together the perfect attire for that special day. You'll find dresses from well-known designers including Christian Dior, Diane Von Furstenberg, and Lanvin. If you're on a modest budget, however, this collection will likely be on the pricey side, unless you manage to snag a dress during the annual sales. The store's large and prestigious beauty, cosmetics, and perfumery departments featuring high-end and mid-range brands such as La Prairie, Clinique, Chanel, La Mer, Laura Mercier, and others. The Gourmet Food Market, La Grande Epicerie, stocks thousands of luxurious and often quasi- exclusive products from around the world. It has a fresh produce department, an in-store butcher, cheese shop, extensive wine selection, and high-end bakery-patisserie, guaranteeing satisfaction for gastronomes and foodies. This is the perfect place to stock up on gourmet gifts to take home in your suitcase. VIP services at the store include personal stylists and valet parking, while the store's "culture department" hosts exhibits and houses a contemporary art collection worth seeing.